Redundancy can be unexpected, and for many can lead to a period of uncertainty. If you’re nearing retirement age, a redundancy payment can accelerate retirement and supplement superannuation, but for others who are the sole or main income earner at a time in life where costs are high, it can be a scary time. 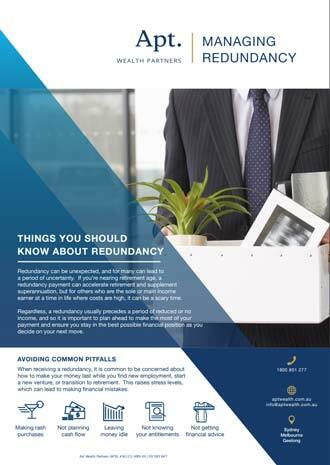 When receiving a redundancy, it is common to be concerned about how to make your money last while you find new employment, start a new venture, or transition to retirement. This raises stress levels, which can lead to making financial mistakes. We understand that financial uncertainty is common with redundancies, and Apt can ease the burden. Whether through cash flow planning, tax effective investments or financial hardship assistance, we help you take and stay in control of your finances. As a trusted partner to over 3,000 Australian families, we have a wealth of experience. We take the time to help you understand all the viable options and possible outcomes, giving you the confidence to make informed decisions for the future. We understand the impact of redundancy goes beyond the financial and have helped thousands of Australians through times of uncertainty. We help you navigate your redundancy with confidence and certainty that you will achieve your financial goals.